As usual my husband hinted at a potential coffeecake this weekend. I hadn’t made one in a while and he said what if there was a recipe for cinnamon swirl coffeecake with caramel frosting he would love that. My google search did not pan out with the frosting part but I am sure I could invent a frosting to add to a future recipe. 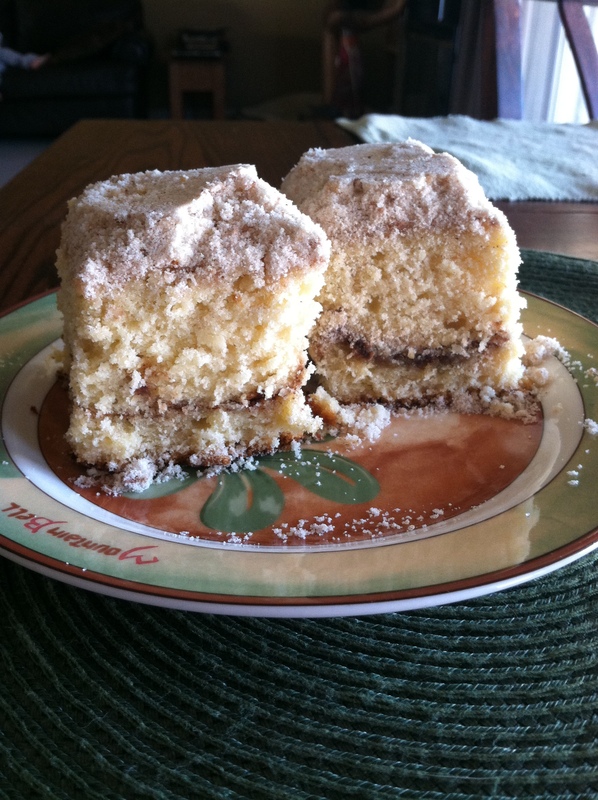 What I did come upon was cinnamon streusel coffeecake from my reliable recipe buddy – King Arthur Flour. I had all the ingredients in the house, a rare occurrence, so I set to work. There were a lot of steps, it was not complicated, just a lot of work. But it was well worth it for this ridiculously delish cake. The cake had so many layers of flavor and yumminess. The crumb topping, the streusel filling, the moist cake – all combined to make a definite recipe box entry. 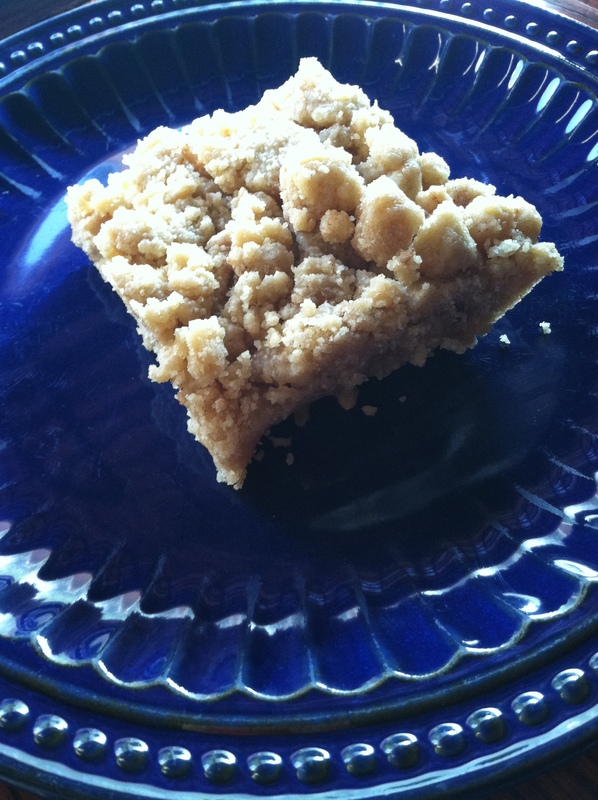 If you are having a well deserved lazy weekend like we did and you are craving a sweet treat, skip the store bought crumb cake and whip this up for a real treat! 1) Preheat the oven to 350°F. 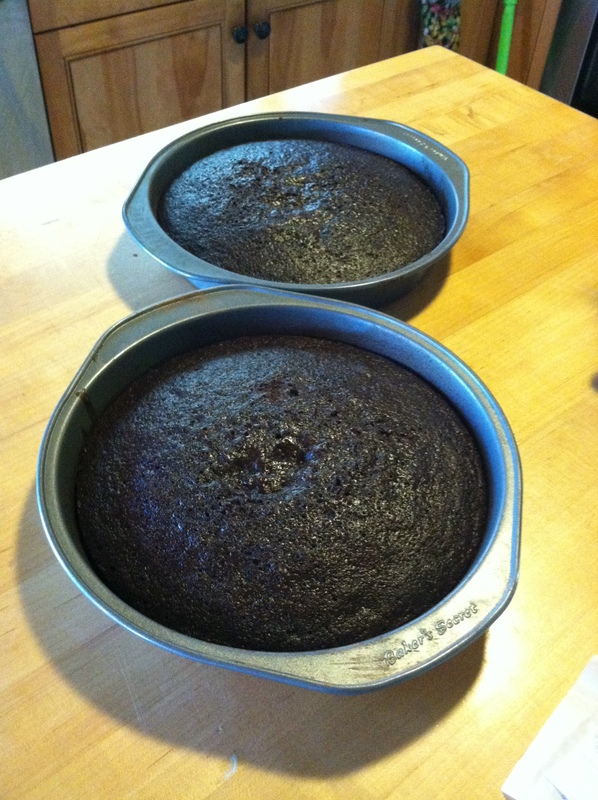 Lightly grease a 9″ x 13″ pan, or two 9″ round cake pans. 6) In a separate bowl, whisk together the sour cream or yogurt and milk till well combined. You don’t need to whisk out all the lumps. 8) Pour/spread half the batter (a scant 3 cups) into the prepared pan(s), spreading all the way to the edges. If you’re using two 9″ round pans, spread 1 1/3 cups batter in each pan. 10) Spread the remaining batter atop the filling. 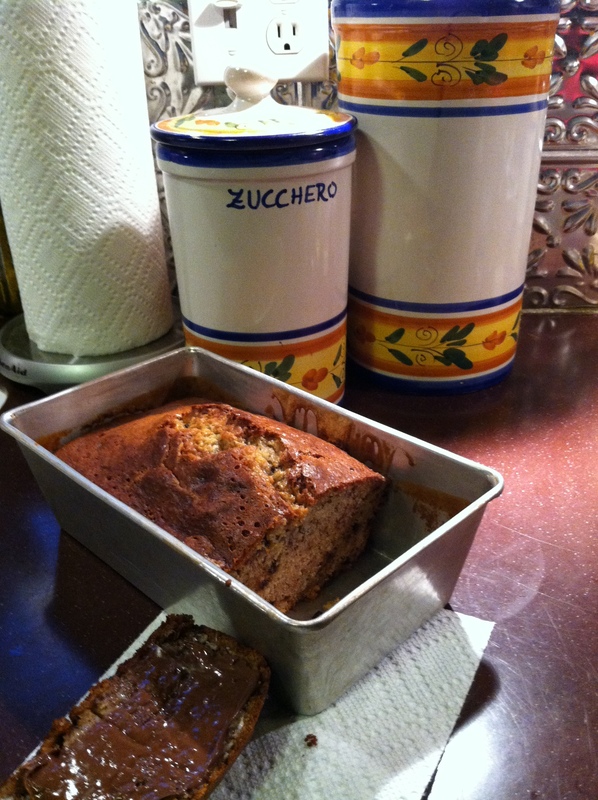 Use a table knife to gently swirl the filling into the batter, as though you were making a marble cake. Don’t combine filling and batter thoroughly; just swirl the filling through the batter. 12) Bake the cake until it’s a dark golden brown around the edges; medium-golden with no light patches showing on top, and a toothpick or cake tester inserted into the center comes out clean, about 55 to 60 minutes for the 9″ x 13″ pan, 50 to 55 minutes for the 9″ round pans. When pressed gently in the middle, the cake should spring back. I love trying out new recipes. Especially ones I collected eons ago and I rediscover. 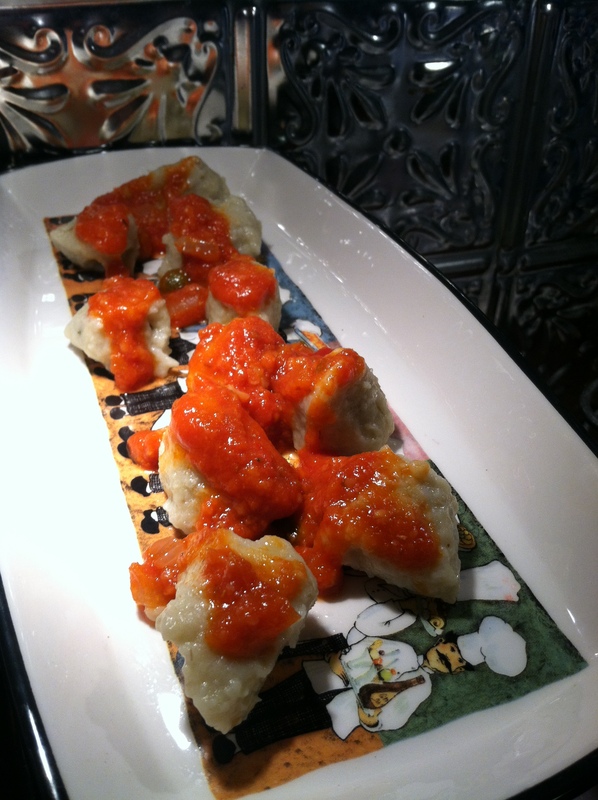 This one was from one of my favorite hunky Chefs, Michael Chiarello. I had printed it several years ago and stuck it in my must try someday binder, which often goes forgotten. I was looking for something tasty and sweet to make for Sofia’s birthday party last weekend and I happened upon this magical recipe for cupcake sandwiches. Think decadent moist chocolate cupcakes split in half and filled with homemade chocolate mousse, whipped cream, sprinkles and mini candies – that is not your typical “sandwich”. We used mini rolos, mini kit kats and reese’s pieces for the candies and some rainbow sprinkles. This was my first foray into making homemade mousse, something my readers know I love – a challenge. The mousse was simple to make but did not come together as creamy as I would have liked so I definitely need more practice. It tasted delicious so that is what mattered. Also the recipe said to bake the cakes for 30 minutes but I always test my cupcakes about 8 minutes early (my secret to not dry cake) and they were done at 22 mins, so be sure to check yours. This cake recipe would be delicious to use without the candy and mousse if you wanted to frost and use a new chocolate cupcake recipe. The superfine sugar, cake flour and mayo really made for a scrumptious cake. Sad to report most of the kids threw theirs away, probably too gourmet for a kids birthday party in retrospect, but the grownups liked them. Also Sofia ate every last crumb, love that little foodie! 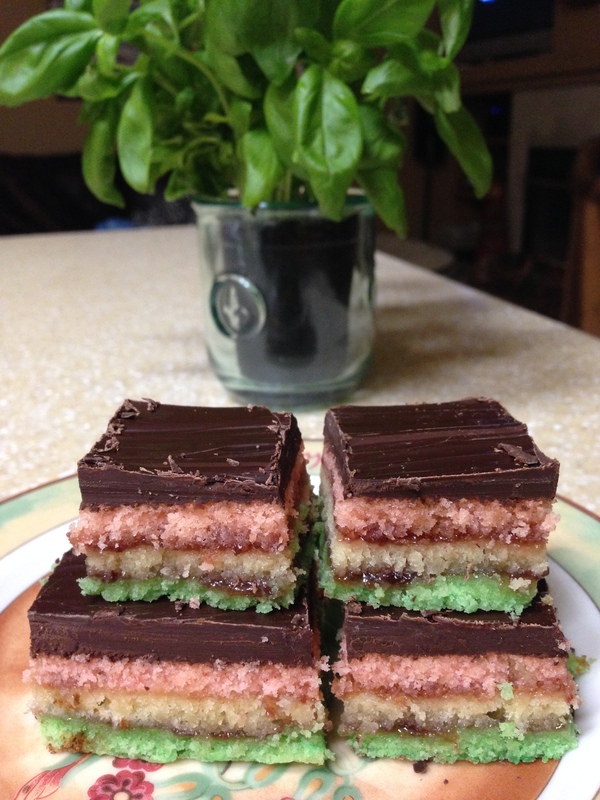 If I made them again I would probably make them a bit more fancy and for a grownup event. So if you want a new take on cupcakes with a beautiful presentation or want to do something cool for an upcoming holiday party you need to check this recipe out! Fill a muffin tin with 12 cupcake liners and set aside. Combine cocoa powder and water and mix until smooth. Fold in mayonnaise. (Make sure cocoa mixture is not to hot to prevent breaking of mayonnaise). Add vanilla and whisk until smooth. In mixer, combine sugar, cake flour, baking soda and salt and mix slowly until well incorporated. Add wet cocoa mixture, mix on medium-high until well blended. Scrape down the sides and blend for 30 seconds. 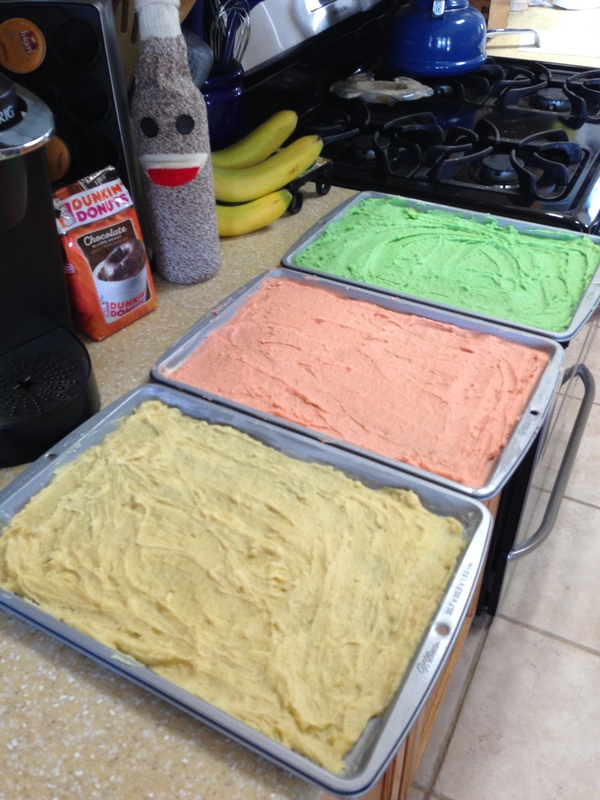 Fill the cupcake liners 3/4 way full of batter. Bake for 30 minutes or until toothpick comes out clean (Mine were done in 22, even with oven at 350). Remove from oven and allow to cool on rack. Slice each cupcake in half, horizontally, and serve the halves with chocolate mousse, whipped cream, and assorted candy toppings. Kids build the sandwiches by spreading one half of a cupcake with mousse or whipped cream, sprinkling on candy toppings and placing other half of cupcake on top. In a microwave safe bowl, combine the chopped chocolate and the butter. Heat in the microwave until melted, about 35 seconds depending on your microwave, and stir to melt completely. Whisk in the egg yolks and set aside to cool. Pour the cream into a chilled bowl of a mixer and beat on medium speed until it starts to thicken. Add the sugar and vanilla and whisk until the cream starts to form stiff peaks. Carefully fold the whipped cream into the cooled chocolate mixture. Serve immediately or cover and chill until ready to serve. 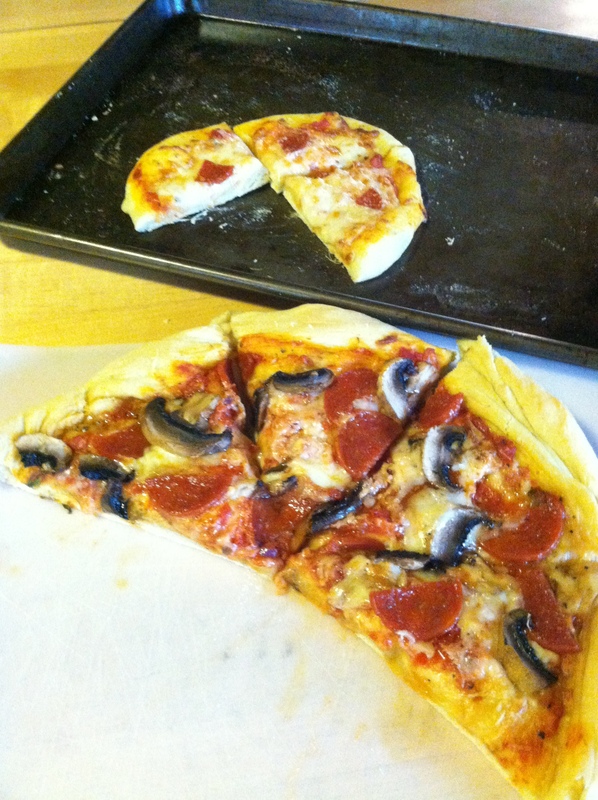 My readers all know I have a go to recipe for pizza dough. But I was feeling like trying something new and I have been inspired lately by my new favorite show from the cooking channel, Extra Virgin. This dough was amazing! The Pizzas came out so nice and thin and crisp. The texture and flavor reminded me of when I was in Italy. My hubby says I should only use this recipe from now on. Place the dough in a large bowl lightly greased with olive oil. Turn to coat all sides of the dough with oil. Cover the bowl loosely with a clean tea towel. Let rise until doubled in size, about 2 hours. Punchdough down, and let rise another hour. Repeat with the remaining 3 pizza dough disks. Cook the pizzas at 500 degrees (he said 550 on the site but I did not want to go that hot) for about 10-12 mins, or in a brick oven, if you have one, maybe in my dreams! I love to challenge myself to make new recipes. My BFF got me hooked on my new favorite cooking show on the cooking channel called Extra Virgin. If you haven’t seen this show yet I highly recommend it. Not only are the recipes amazing and authentic Italian family recipes, but the couple, Gabriele and Debi are so fun to watch. They inspire me to cook more with my hubby in the kitchen. I recently saw an episode telling the story of pici pasta, hand rolled noodles that are a tradition in the Florence region. I googled and found a great rustic recipe that looked authentic like the Extra Virgin episode version. 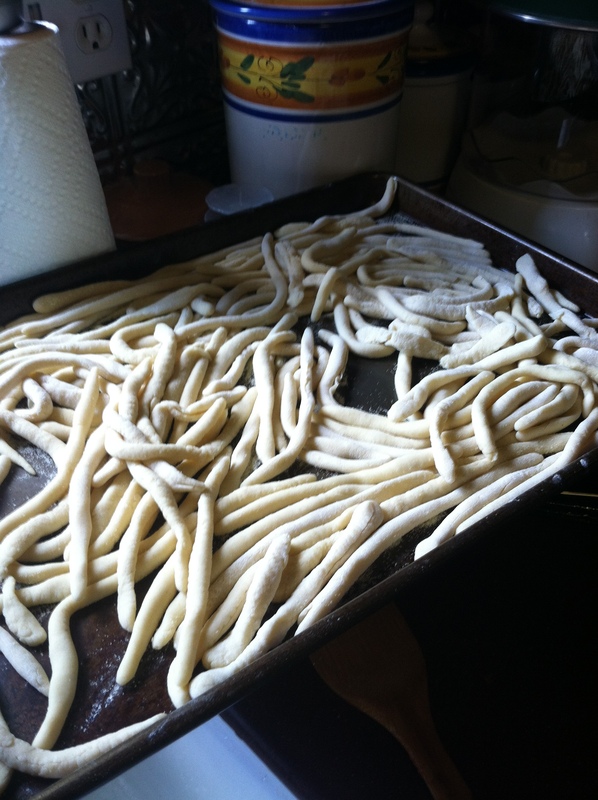 Last night we made the pici and I have to say they came out delicious. It was so fun making the noodles all together as a family, as I usually micromanage and kick everyone out of the kitchen. It was a bit of a time consuming process rolling each noodle by hand, but well worth it for the taste and the experience, if you like to challenge yourself as a cook, like I do. The tip in the recipe about rolling the pasta dough into grape sized balls really did help to make process go smoother. In a 10 to 12 inch deep sauté pan, heat the olive oil over high heat until almost smoking. Add the onion, carrot, pancetta and basil, reduce the heat to medium high and cook until the pancetta has rendered its fat. Season the ribs with salt and pepper and add it to the pan, cooking until they are browned on all sides. Add the wine and simmer for 5 minutes. Add the tomato sauce and bring to a boil. Then lower the heat to a simmer and with salt and pepper. Cover and simmer gently until the meat is tender, about 1 hour. After you make the pici pasta dough as instructed below, shape small bits of the pasta dough into grape sized balls. One at a time, on a surface very lightly dusted with flour, roll each one into a rope 1/8 inch thick and 6-8 inches long and set aside on a baking sheet dusted with semolina. This is a time consuming process so plan ahead. If you don’t have extra time, this dish would be great served over orzo, fresh fettuicine or any of your favorite pasta. Bring 6 quarts of water to boil in a large pot and add 2 tablespoons salt. Drop the pasta into the water and cook until tender, yet al dente, about 7-8 minutes. Do not pour the pasta in a strainer, strain in small batches with a small strainer over the pot of water and toss right into the pan with the sauce and stir gently over medium high heat for 1 minute. By adding the pasta right from the water to the sauce you marry the two together. Divide evenly among four warmed pasta bowls to serve. Top with freshly grated parmigiano (or Romano, you know I prefer that) and serve. Shape small bits of the pasta dough into grape sized balls. One at a time, on a surface very lightly dusted with flour, roll each one into a rope 1/8 inch thick and 6-8 inches long. Place the pici on a sheet tray that has been dusted with semolina flour, cover the pasta with a clean dish towel, and set aside until ready to use. At this point, the pasta can be frozen for several months. I love my usual go to gnocchi recipe I posted before but tonight I decided to branch out and challenge myself and make some eggplant gnocchi aka Gnocchi di’ Melanzane. The secret is you puree roasted eggplant and put it in your gnocchi dough. 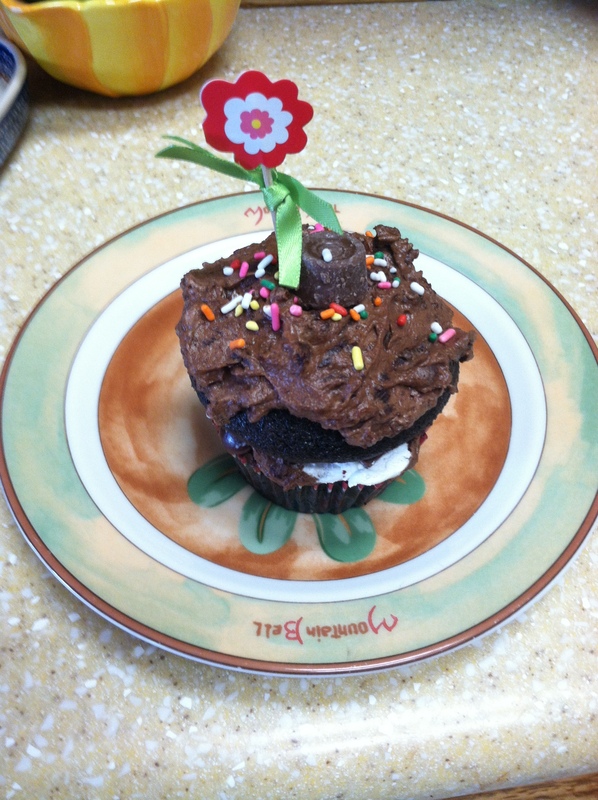 The best part was that my kids ate it and I got eggplant into their tummies! I topped it with my favorite sauce, my leftover cacciatore sauce. After you make a big pot of cacciatore there is always leftover sauce. According to my research, gnocchi are little dumplings that can be varied by adding cheese, vegetables, herbs, or even fruit to the basic dough. Just look for whatever is in season and blend it into the dough for a special treat. Preheat oven to 375 degrees, halve eggplant lengthwise and brush olive oil on, then put cut side down on foil lined baking sheet and bake about 40 mins, till tender (or less if you are using several small eggplants). While eggplant is cooking boil potatoes in salted water for about 30 mins till tender. When it is cool enough to handle peel eggplant and puree in food processor. Allow puree to cool completely. When cool enough to handle, peel potatoes and use potato ricer to squeeze them into a large bowl. Add the eggplant puree and the cheese and mix well. Add the eggs, salt, pepper, and basil and mix to blend. Add flour and mix to incorporate, but do not overmix. Bring large pot of salted water, about 6-8qts, to boil. Fill pastry bag with eggplant mixture and when the water boils, pipe 1/2 inch long pieces, cutting using pastry scissors, dropping them into the boiling water. Work rapidly until all the dough is used up. 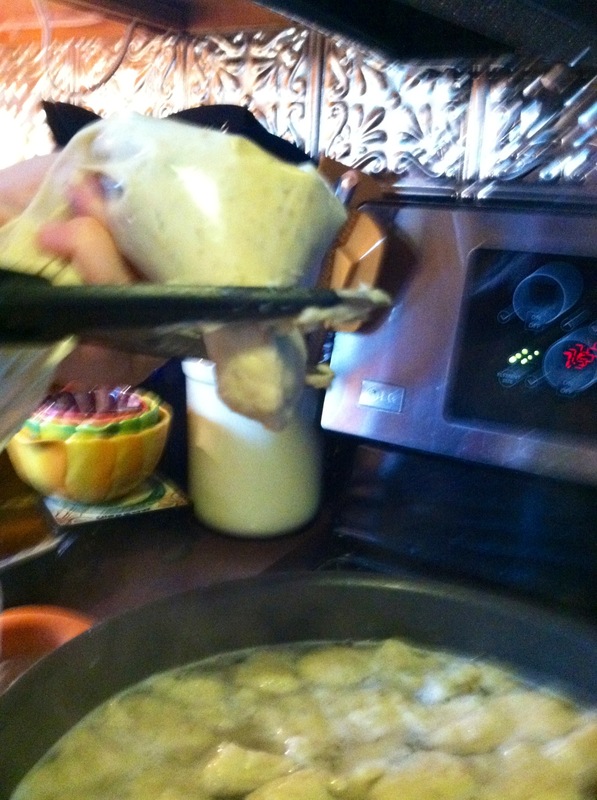 Allow gnocchi to cook until they float to top and then drain on a slotted spoon and place in a bowl. Butter lightly and keep warm. Top with your favorite pesto, alfredo (my pistachio alfredo would be great), red sauce and freshly grated cheese and manga! 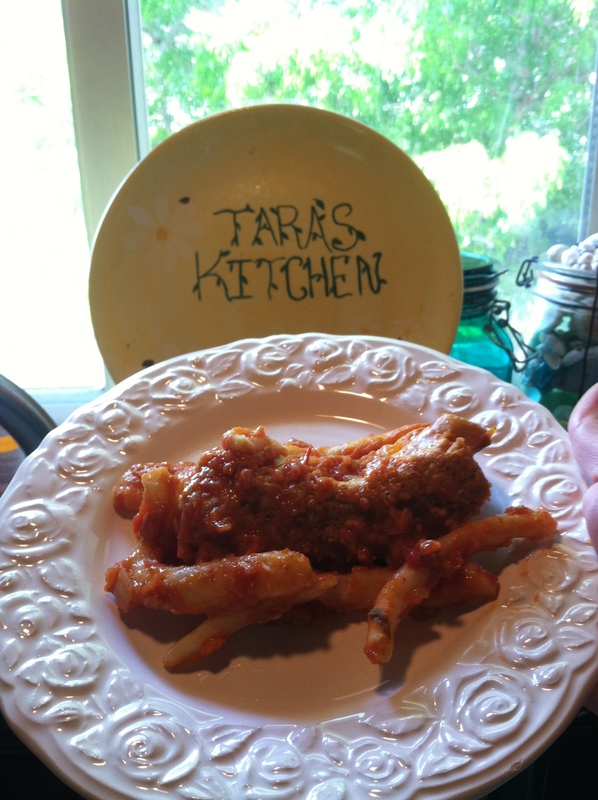 You are currently browsing the archives for the what tara’s cookin now category.